With creamy ice cream and delicious mochi, is there any better dessert than mochi ice cream? With our variety of flavors that can suit every mood, we certainly don’t think so. Whether you’re craving a classic like vanilla bean or are feeling a little exotic and want to try mango, there’s a My/Mo flavor for every mood. Whether you’re sharing with friends or savoring the box for yourself, mochi ice cream is the perfect treat for every occasion. Explore our many indulgent flavors below! If you love chocolate, this mochi ice cream flavor is for you. Our ice cream is made with real California milk to ensure premium creaminess for all the chocolate-lovers out there. For the double chocolate crunch, we add chocolate chips so no chocolate craving goes unsatisfied. Surrounded by our secret recipe mochi, Double Chocolate My/Mo Mochi Ice Cream is the perfect way to treat yourself on the go. Need a break from work? Escape to your own personal paradise with Sweet Mango mochi ice cream. The tangy ice cream blends perfectly with the sweet mochi dough to create the ultimate tropical dessert. The small size makes them a perfect treat for lunch at the office, and you’ll have plenty to share. Although, we understand if you don’t want to. You can never go wrong with a classic like Vanilla Bean ice cream. Our mochi ice cream uses real vanilla to create a deep flavor and infused richness you won’t be able to get enough of. Perfect for those summer days, our vanilla bean mochi ice cream will offer a sweet escape from the grueling heat. The taste of fresh mint and real chocolate chips give this mochi ice cream its irresistible flavor. 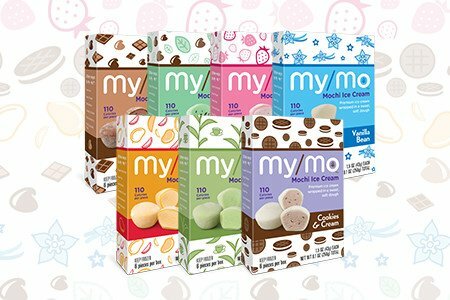 Cool and creamy, Mint Chocolate Chip My/Mo Mochi Ice Cream promises refreshment on the go. Our sweet mochi dough makes it easy to take this calming dessert on the go, in the car, or even to the couch. When you can’t pick between cookies and ice cream, the only solution is picking up a pint of cookies & cream ice cream. However, our mochi ice cream takes this dessert favorite one step further as the sweet mochi dough lets you take it on the go. Enjoy this sweet treat on a picnic with the family or while watching your favorite movie. No matter how you enjoy it, Cookies & Cream My/Mo Mochi Ice Cream is sure to be a crowd favorite. For a light, fruity flavor that certainly doesn’t disappoint, try our Ripe Strawberry Mochi Ice Cream. Bursting with a sweet and juicy fruity flavor, the mochi dough holds premium ice cream that was made with real strawberries. Even if you’re not a tea drinker, you’ll love our Green Tea My/Mo Mochi Ice Cream. Green tea is crafted into premium ice cream and encased in authentic mochi dough to provide a melt-in-your-mouth experience you won’t soon forget. Enjoy the traditional flavors of Japan without having to leave your kitchen.